We have increased our production capacity - so prices have dropped and we have new flavours...such as the eat in the hand range "Roly Poly Goalie Pies"
This is a market is growing by over 60% a year and is already worth an estimated £500,000 annually. More and more people are looking for quality free from food for them and their friends. Add our products to your current business and increase your profits. 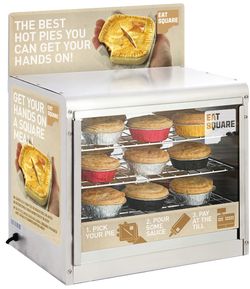 If you are looking to sell our pies hot to clients who need a quality handy meal then perhaps one of our free-on-loan pie warmers will suit you. Eat Square has a passion for quality and good Wiltshire produce. If you want to align your business with a brand that stands for quality and integrity then get in touch.